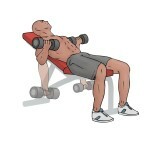 Sit on an incline bench with a dumbbell in each hand being held straight down at arms length. This is the starting position. Keeping your elbows close to your side, curl one arm and rotate the wrist so the palm is facing up.